Stieglitz opened a small gallery at 291 Fifth Avenue in 1905, just 291 for short, and for a few years he showed the work of photographers published in his magazine, Camera Work. But following an exhibit of drawings by the French sculptor Auguste Rodin in 1908, 291 became a showcase for the masters of European modernism, including Henri Matisse and Pablo Picasso. Stieglitz also promoted the work of American artists at 291, including that of an unknown young woman, Georgia OKeeffe. 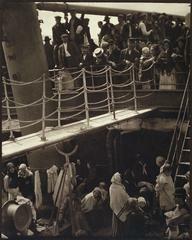 The Steerage marked a turning point for Alfred Stieglitz. In it, he abandoned the idea that photographs should bear some likeness to paintings, and embarked on a new path to explore photos as photos in their own right. The man who had led the charge for photographs to take a place beside painting in the world of art now took straight photographs that looked like camera work, not brushwork. In 1923, Stieglitz wrote, My photographs look like photographs and they therefore cant be considered art. (Camera Work, A Pictorial Guide, 1978) He never even attempted to cover up the changes in his thinking. As well as being a fundamental shift in Stieglitzs thinking about pictorial photography, this picture serves as a comment on economic divisions of society. The white gangplank that divides the picture into two parts, upper and lower, also serves as a symbolic divide for the people in the picture. Below the line is the steerage, one big hold reserved for people who couldnt afford staterooms. Above the line is an observation deck for everyone aboard the ship. The photographers graphic vision of shapes and balance and the social conditions of the day are united in one remarkable picture. Ironically, Stieglitz would not recognize the social aspect of this photograph until many years after he had taken it. For Stieglitz, the main considerations were visual.